April 23, 2011: The Diamond Exchange #1 | Esc.rec. April 23, 23:00-3:00 hrs. 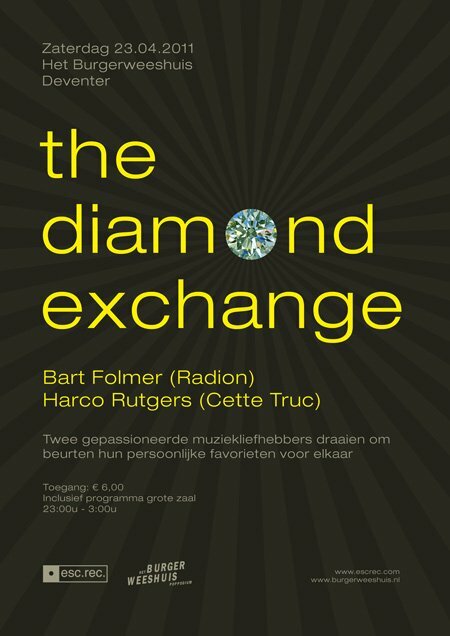 in Het Burgerweeshuis, Deventer: The first edition of The Diamond Exchange, with Bart Folmer (Radion) and Harco Rutgers (Cette Truc). You have to pay 6 euro to get in, but then you also get to enjoy the 5 year anniversary of Deventer Dub Sessions with San Soda and Tom Trago.